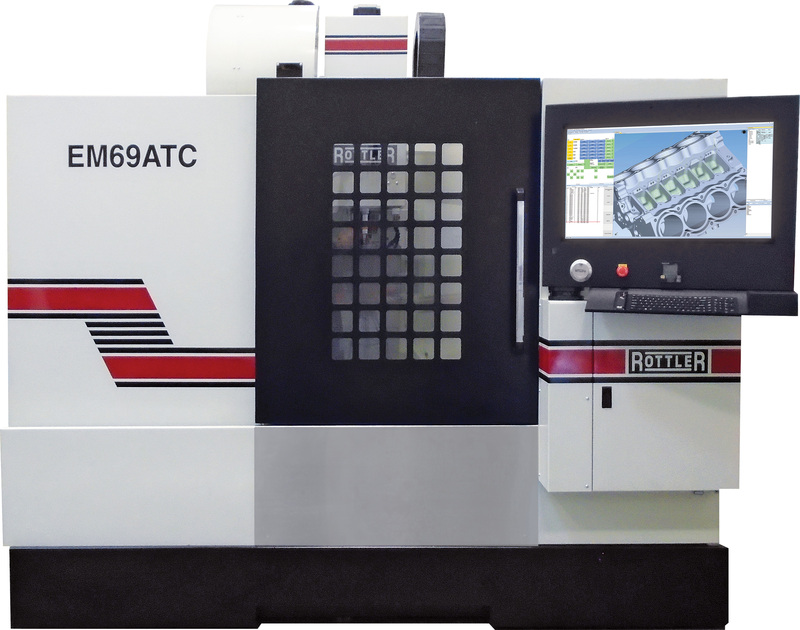 The EM69ATC 3 and 4 axis CNC Machining Center is versatile and great for machining engine blocks and making custom parts with a 24-tool Automatic Tool Changer. Read more in the "Features" tab below. Rottler’s totally new, next generation CNC control found in the EM Series machines continues to give users unmatched speed of learning and ease of use when probing/digitizing without the need of additional cumbersome and expensive software. This advanced 4C software lets users know they are machining with the most state-of-the-science equipment available. Read more in the "Control" tab below. Instant Internet Support - Rottler offers cutting edge internet support direct from your machine to the factory. Skype and a webcam are installed for video conferencing and internet support. This feature gives you instant, direct contact with Rottler right on the machine without even making a phone call. The standard webcam comes pre-installed so that Rottler Technicians can see exactly what you are seeing, this saves a tremendous amount of time when trying to answer questions. Shop busy or too noisy for talking? The pre-installed Skype application gives you instant messaging capabilities with Rottler Technicians. Automatic Tool Changer - 24 Space Automatic Tool Changer for CAT40 Taper tools. The tool changer can handle up to a 10" (250mm) diameter tool weighing 15.5lbs (7kgs). Windows Operating System - Rottler uses Windows and Touch Screen Technology/ through a 32" (813mm) panel. The Windows software has many advantages such as a common user interface that the whole world is familiar with. Touch Screen Control - Two different operating systems are available. (1) The Rottler system for simple, fast and easy programming of common jobs such as boring, surfacing and line boring. Anyone can learn in a few hours. (2) The other is the Optional 4C CAD/CAM software for advanced CNC programming for endless opportunities such as making parts, engraving names and much more. Brushless Servo Motors with BISS Encoders - The EM69ATC has the latest technology servo motors with BISS encoders offering 100 times finer resolution compared to previous models. These new Servo motors give maximum torque and performance throughout the RPM range for improved accuracy and increased productivity. BISS encoders eliminate any limit switches and do not require homing at star up saving time and increasing reliability. Electronic Hand Wheel - Offers operator infinite control of machine movement in all axes for quick and easy setup. Also controls variable feed rate during automatic cycles. Spindle - Super hard finish resists wear for years of operation. 0-10,000 RPM Spindle Rotation with quick change CAT40 Taper. Massive Frame - Massive Frame boasts full enclosure with Sight Panels in front and on sides of enclosure to view work area. Direct Drive Ball Screws - Direct drive precision ball screws for faster rapid feed rates and accurate positioning eliminating backlash problems relating to belt drive systems. Linear Roller Slideways - All Axes of the EM machines are supported on low friction Linear Roller Bearing Slideways allowing fast acceleration and precise positioning for more production and precision parts. Large T-Slot Table - Allows operator to clamp or fixture any job quickly and easily. Coolant Tank - Complete coolant system for tool lubrication during machining. 30 gallon capacity. Automatic Lubrication - For years of trouble free life and reduced wear. Chip Auger - Automatically removes chips from enclosure and deposits chips in wheeled disposal cart. CNC (Computer Numerical Control) Machine using Windows Operating System and Industrial PC with Intel Processor. Precision Programming and Control through a 32" (313mm) Computerized Touch Screen. Software options available for Programmable & Automated Cycles such as Boring, Surfacing, Lower Sleeve Offset Boring, Water Hole Repairs, Main & Cam Line Boring, General CNC Machine Work and more. What is 4C Software? Rottler’s newest EM Series equipment offers Computer Numeric Control (CNC), Computer Aided Design (CAD) and Computer Aided Manufacturing (CAM) in the industry’s most advanced Computer Measuring Machine (CMM). The 4C technology allows users to digitize, edit designs and begin cutting in less time but also requires less machining/programming expertise compared to many other systems. This brand new, revolutionary CNC machine CAD/CAM software allows 3D CAD Solid Models to be imported or created at the machine – the built-in CAM functions can be used to semi-automatically and interactively create complex 3D tool paths direct from the CAD geometry. One of the main features is the EM series’ expanded size 32˝ touch screen – by maximizing screen size, Rottler’s CAM software allows unprecedented amounts of information to be displayed for the operator’s use. The user can choose the information to be displayed for incremental and interactive functionality. Bores complete bank in Automatic Cycle. Surfacing Multiple Pass programmable for roughing and finishing can remove any amount of material in one automatic cycle. Enter desired deck height of block and themachine will cut to that height. No more guess work! Lifter Bore Machining - bore housings and bushings to exact final size. Automatic line bore cycle completes all main bearing housings to within .0002”. Face main line thrust bearing faces square to crankshaft centerline. Rottler PATH CNC program allows G code programming and file transfer with CAD/CAM programs.